Anil Jwalanna Co-Founded WittyParrot along with Rajesh Setty. Anil has been an entrepreneur for quite a while and has also been in the managing IT teams from business side and has been providing solutions to the business folks on both Hardware and Software. Anil found that one of the biggest challenges, the sales people had was in struggling in getting the right information on time and give it to prospects as early as possible. Sales people spend a lot of time in searching for information to be sent and they prepare new collaterals and even write new mails in-spite of having the same collateral somewhere in-house leading to lot of redundant digital asset creation leading to loss of time and effort. Anil used to train the sales people on how they can easily search for information and also used to purchase multiple tools for the sales team and had lots of in-depth knowledge on the automation needs of the sales teams. 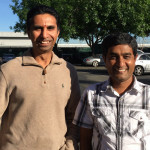 Having found this opportunity, Anil and Rajesh jumped in to build a product platform to help the sales people leverage the evolving mobile technology and social media platforms and contextually answer to the questions the buyer has and also provide quick information because the prospective customer forgets the sales person once the conversation/meeting is over and delayed responses are not being given much weightage. Since Anil himself had felt this problem in his past, he knew that this will be a need for lots of sales teams .They built a base product and began talking to hundreds of sales teams and sales leaders for around 9 to 12 months and gave them presentations and iterated with them on the product features right from html mock-ups to a working product and developed the product along with their customer. They went to a lot of conferences and got feedback from a variety of sales teams on what features will work in the small, medium and large companies. They say that the efforts in the initial days are best spent if one will talk to people you know, who can try out and give you honest feedback. By careful observation, they learnt significantly how to find the leads, how to demonstrate and also understood the sales cycle and the different iterations that they have to go through the sales cycle. They figured out the best way to generate leads will be through email marketing and content marketing and the sales person takes over when the enquiry becomes a lead and takes them through a standardized demo. The sales cycle is divided very clearly into multiple stages with multiple deliverables and Anil gives an example of a stage in the sales cycle where the main purpose of the initial conversation is to listen to the situation or the problem of the prospect and then they figure out the solution and discuss about it and not to sell. They then do a custom demo based on the problem they have identified to make the demo very useful to the prospect to help them pave the shortest path to closure. Since they are a content productivity solution which involves content specific to the customer from the website they began showing the demo of the customer’s content in their platform that gave a WOW factor because the customer no longer imagines how the product will suit them and sees live data and connects immediately. 30% to 40% of their learning of the product is within the office and the remaining 60% of the use cases specific to different businesses can only be learnt along with the customers. Anil quotes that the most important use case with the sales team extended into other departments within the customers place and now talent acquisition use case has become the biggest market today. Many founders ignore this small thing of learning with customers but later comes back in a big way to impede the business growth. The first couple of customers came from their rolodex – the network of contacts like any other start-ups because they will be the only category of people who will take a risk on a new company , new product, with risks of company not in existence after a while and company not having the money to scale etc. Evaluation of the products for Start-ups with a free offer in the consumer market is very different in the business market. The people known to you have commit to work with you on providing you the money, time, content and convincing the internal team to work with you which is a heavy commitment. One needs to find such evangelistic customers at the beginning. Go with the personal network who is very influential because at end of the day , you would also need one or two customers to stay with you till the end and give reference when you would go and sell to new customers. You need to figure out what product you are selling and what problem you are solving to what persona and message to all stakeholders accordingly. In selling, they tried conferences with setting up booth which was the most expensive option and did not yield anything for them. They tried advertisements on Facebook, Twitter and Linkedin and that also did not yield much except brand awareness. The three areas that worked for them in sales were 1) Email marketing 2) Outbound Sales Calls 3) Personal Network of Advisors, Investors, Friends and Families who can introduce them to their network. Anil’s advice to startup founders- Always evolve your product along with the customer’s needs, what we started with a few years ago is only 30% of what the product is today. Your goal is to solve a business problem through the product and once you analyse how your customers are using your products, your product roadmap will change. One needs to have a strong Value Proposition that should be convincing for the Buyer to buy. Finding the match is the most toughest part but is the most important work to do. Sales does not end with just closing the deal but one needs to make it successful by giving support. Enterprises also have tons of specific needs in integrating your product with multiple other systems which needs to be factored in along with your product implementation. WittyParrot (http://www.wittyparrot.com/), has won the Top Sales Tools Award Gold and Silver and has 10 plus F500 clients which includes Kaiser Permanante, VMWare, Siemens, Harmonic, RiverMeadow to name a few. The US entity has 6 employees in Sales, Marketing and Thought leadership and the subsidiary in Bangalore has 35 employees that does Product Dev and the backend marketing happens in India.